dresses, your flowers, and the room will all collaborate to create an inviting entertaining space. The secret lies in the type of lighting, where to place the light, and using it to enhance and boost the already beautiful aspects of your wedding. Most clients want to add color to their room or recreate an effect they’ve seen in a magazine but aren’t sure where to start or how to go about it. If you can provide us pictures of the result that you are looking for we can help put together a package to meet your needs and brainstorm all the possibilities that fit within your vision and price range. These lights are made up of red, green and blue individual LEDs that when combined in different intensities blend to create just about any color. These lights are also very lightweight enabling them to be used on stands, on the floor just about anywhere. Almost all events we light we use LEDs for Uplighting. Traditionally the industry has used stage lights or “PAR Cans” to uplight weddings. These are bright white lights that have a “gel’ or colored plastic film placed over the light. These lights are limited to one color and get scorching. If there are children or there isn’t enough room to put these lights, guests can burn themselves. These lights also draw a lot of energy and can heat up small rooms quickly. The most popular effect is to provide splashes of color or colors around the room. They can either be set to a static color or fade through colors at varying speeds. You may want a static color as guests arrive and through dinner but the lights to slowly sink through the dancing portion of the evening. A focused beam of color or light on certain aspects of the room may be requested. Having beams of light to add more focus to the cake or drama to columns or dimensions of the room may be a good fit. Focused beams of light to the exits and entrances of the room may is a subtle detail. LED’s can slowly fade into some colors, quickly change colors, strobe, or switch to the beat of the music. Each of these effects may be nice for dancing. With the controller, we can operate and program preset effects ahead of time so the lighting will be exactly what you expect. This effect can look great with a bar or the head table. Having white linens surrounding the table and placing a light or lights on the table can add washes of color to the physical table in the room and look elegant. Maybe you would like to add touches of colored light to each of the guest’s tables. With LED lighting, we can raise the lights and project colored light onto your guest’s tables. This can be nice to create a lounge atmosphere or feel of the room. 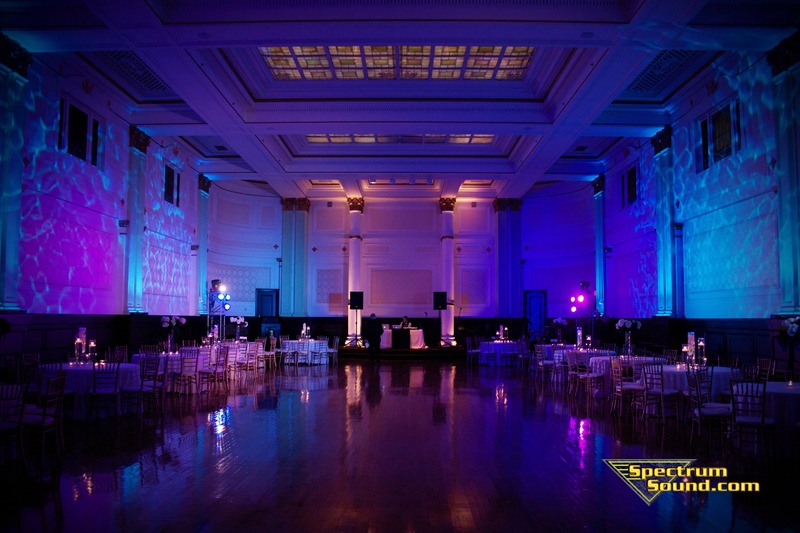 Lighting up the exit of the room or venue can be a beautiful effect for the photos at night time. If you have a sparkler exit, have a really unique hotel, or otherwise, would like to set the mood on the outside of the venue as well as the inside, placing LED lighting outside can be a very dramatic effect. When coming up with a budget for your wedding think about lighting. For a fraction of the cost of extra flowers, favors, or other types of decorations you can add the elegance and impact of painting with light to your wedding. Lighting not only works well during the entire event, but it allows your flowers and other decorations to shine later on in the evening. When it’s dark for the reception guests, always notice the lighting and continually thank us and comment on how much it adds to their event. It looks great in the photos as well; turning ordinary candid during dancing into the beautiful event that your wedding deserves to be. We work with you to come up with one-of-a-kind lighting options for your wedding that will set your wedding apart and make it truly personal and unique. We can work within the budget to create the biggest impact. We have worked with many of the best venues in the Tristate Evansville and Louisville area and can offer our personal insight as to what the best lighting options will be for each venue. This type of expertise and integration into your entertainment is what makes us one of the best entertainment companies in the area. If you would like to meet the most experienced, fun, and versatile DJ professionals, and Mc’s in the TRI-STATE area, call my office at 1.812.401.4931! DJ/MC/VJ Terry Tunks and his talented team of entertainers have entertained at any thousands of events over the years. Evansville, Indiana, Newburgh, Indiana, Owensboro, KY and all across Southern Indiana and Kentucky. In towns like JASPER, FERDINAND, FRENCH LICK, WEST BADEN, HUNTINGBURG, AND SANTA CLAUS, IN. Based at one time in Louisville, KY As a result of sponsorship of Coca-Cola. SPECTRUM SOUND is just as comfortable entertaining small groups at a casual affair to 18,000 at the THUNDER OVER LOUISVILLE DERBY CELEBRATION.